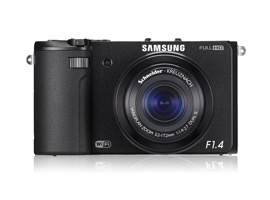 Samsung’s EX2F is a compact camera that replaces their previous EX1 model. 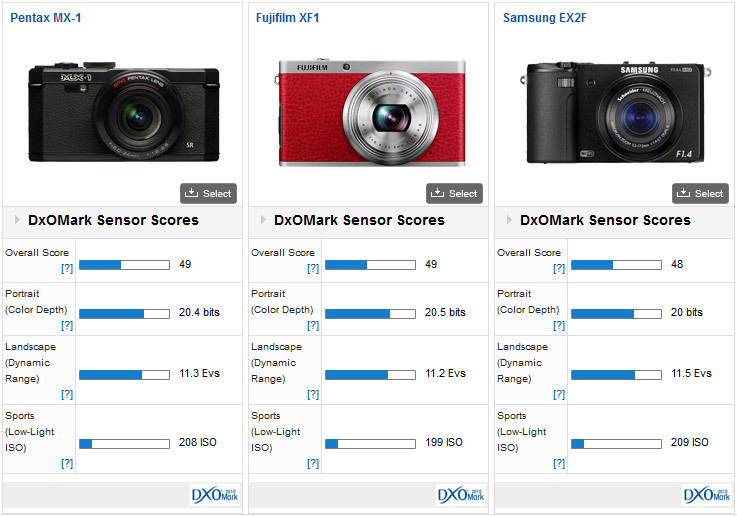 The 12 megapixel BSI CMOS sensor gives the EX2F an extra 8 points in the DxO Mark score, 48 against the previous 40. The EX2F is a sturdy but light camera with a magnesium alloy chassis, it is fitted with a Schneider Kreuznach 5.2mm – 17.2mm lens (equivalent to 24-80mm in full frame 35mm). Schneider, if you are unfamiliar with them, are a German lens manufacturer known especially in the professional market for their large format lenses. Optically this lens has 11 elements arranged in 9 groups, 4 elements are aspheric and 2 are made of high refractive index glass. The lens boasts an impressive f/1.4 aperture, this is for the wide angle end of the scale and makes it one of the fastest lenses in its class. The maximum aperture drops to f2.7 at the telephoto end of the range. To allow users to utilize the shallow depth of field that such a lens creates a neutral density filter is built in for when the light levels are higher. The range of features is fairly standard, the only special features being that the image stabilization utilizes both optical and digital techniques (Described as Dual IS) and that there is a fairly comprehensive WiFi system which allows for backing up, sharing, remote control and remote viewing (via an app on a smartphone – Android or iOS). The ISO Range is between 80 and 3200 but can be extended a further two stops up to 12800 ISO if required. As one would expect it will shoot full HD video and captures 12mpix stills at the same time. 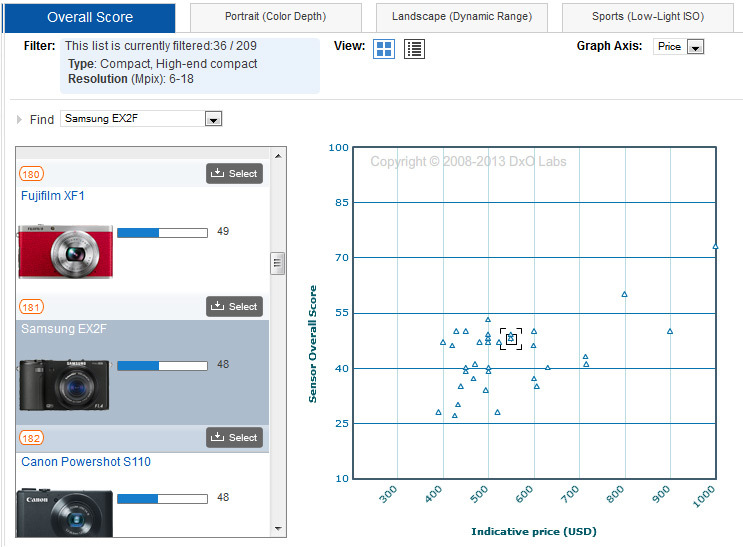 The individual scores are, for Portrait, 20 bits of color depth – which is at the low end of the group, for Landscape 11.5Ev of Dynamic range – which is just above the middle of the group, and for Sports 209 ISO – which is at the upper end. 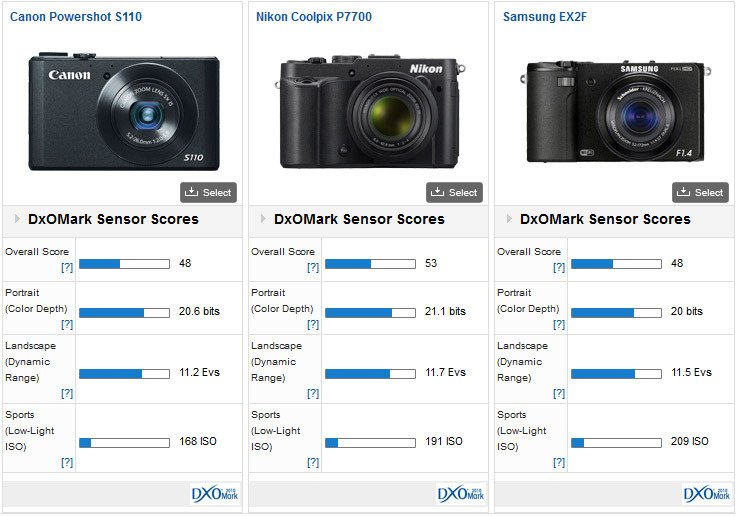 However, the range from low to high for all of these scores within this collection of compact cameras is very small, only 1.1 bits of color depth, 0.5 Ev of Dynamic range and about the 0.3 Ev of low light sensitivity separate 8 different cameras with very similar specifications. All of the cameras have similar sized sensors, 1 1/7” or 5.6mm x 7.4mm or slightly bigger, which would seem to suggest that this is as good as it is going to get and that the EX2F is well optimized within the specifications that it has. Positioned in the middle of the cluster the EX2F has a better score than some costlier cameras but is also beaten by some cheaper. 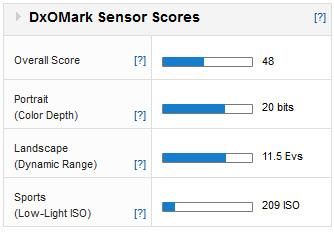 With an overall DxO Mark score of 48 the Samsung EX2F is in a good place. On a chart of all tested compact and high end compact cameras, plotted against price the EX2F is positioned in the middle of a small cluster of very capable cameras. These three cameras are as close as peas in a pod: they have similar zoom ranges, similar specifications, similar prices and similar scores. There is really very little to separate them in terms of performance. 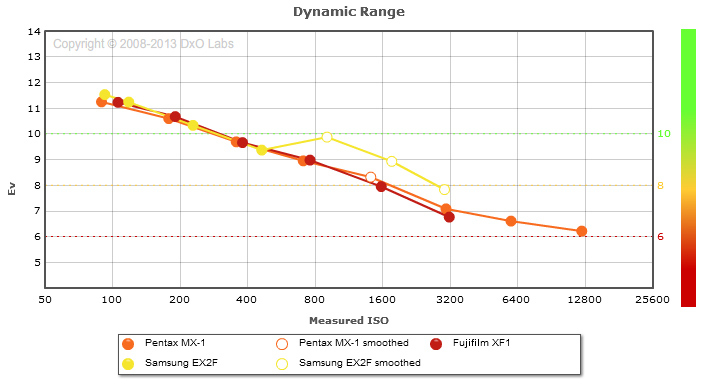 The Pentax MX-1 and the Fujifilm XF1 both achieved 49 in the overall DxO Mark score, over the 48 of the EX2F. The best choice out of these three is going to come down to which has the features that most interest you or possibly which you like the look of. At ISO up to 400 the three cameras are very close. At higher ISO the smoothing applied by the EX2F gives a good score in this test but almost certainly at the expense of detail during the aggressive application of noise reduction. 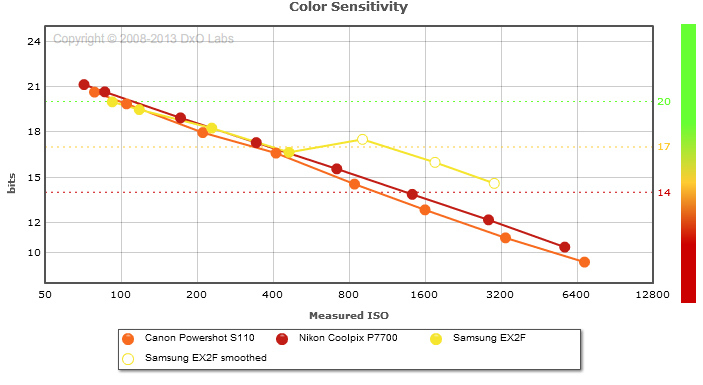 The Nikon Coolpix P7700 scores a full 5 points better than the EX2F, it has 1.1bits more color depth. The Canon Powershot S110 also has more color depth, 0.6 bits, though it fails to match either the Samsung or the Nikon for low light with a score of 168 ISO. The biggest surprise is just how close together these three are in price. The deciding factor here is what you want to get out of your camera: if you want selective focus or are keen to be able to share your images immediately the Samsung fulfils the brief well, but the Nikon, especially of these three, with its greater zoom range and superior color appears to be a very worthy competitor. It is unfair to wait right until the end and then introduce yet another camera into the mix but there is another camera, which is more expensive but which otherwise overlaps all of the others compared here. The Sony Cybershot DSC-RX100. Here there is one major difference, which is that the sensor is much larger: it is a 20 Megapixel sensor measuring 8.8mm by 13.2mm, but the equivalent focal length range is similar, 28-100mm. Is this fair? The Sony is quite a bit more expensive, between 30 and 50% depending on where you are, but the performance of the RX100 is so good that this higher price is probably justified. A DxOMark score of 66, 18 higher than the EX2F, 22.6 bits of color depth, 2.6 better than the EX2F, 12.4 Evs of dynamic range, 0.9 of a stop better and 390 ISO, just under a stop again. The Sony is also smaller and lighter and it has full HD Video up to 60fps. On the down side: it does not have the WiFi and the lens is not quite as fast. If you have a tight budget then the Samsung EX2F is a well specified camera for the money, there are a couple of things that make it very interesting, especially the f1.4 lens, it would be even nicer if the aperture were fixed through the range. Other cameras in this sector do other things better, the Nikon Coolpix has a better zoom range, the Fuji XF1 looks nicer and so on, but if you want a camera to fit in your pocket and to give you the best possible images I’m afraid I would be getting my credit card out and paying the extra for a Sony DSC RX100.